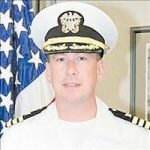 U.S. Navy Commander Philip A. Murphy-Sweet of Caldwell, Idaho, operationally assigned to Joint Contracting Command, Multi-National Force-Iraq was deployed from his permanently assigned command of Naval Inventory Control Point, Mechanicsburg, Pennsylvania. On April 7, 2007, CDR Murphy-Sweet was killed in an improvised explosive device attack while traveling in Baghdad. He was 42 years old. CDR Murphy-Sweet’s daughter is a past recipient of the Folds of Honor Higher Education Scholarship.